This is the third British sports car I have owned. The first was a 1966 Spitfire that I purchased in 1972 while living in California. I really had fun with that car and in some ways, I wish I had kept it! I sold it when I moved to San Francisco, since I didn't need a car there. In 1979, after my wife and I got married, we bought a TR3B for use as a second car, living in Connecticut. It was quite a rust bucket, but we drove it everywhere in all kinds of weather. We took it with us when we moved to Virginia. I had planned to do a full restoration, but it got to be too much of a project, so I sold it for parts in 1982. 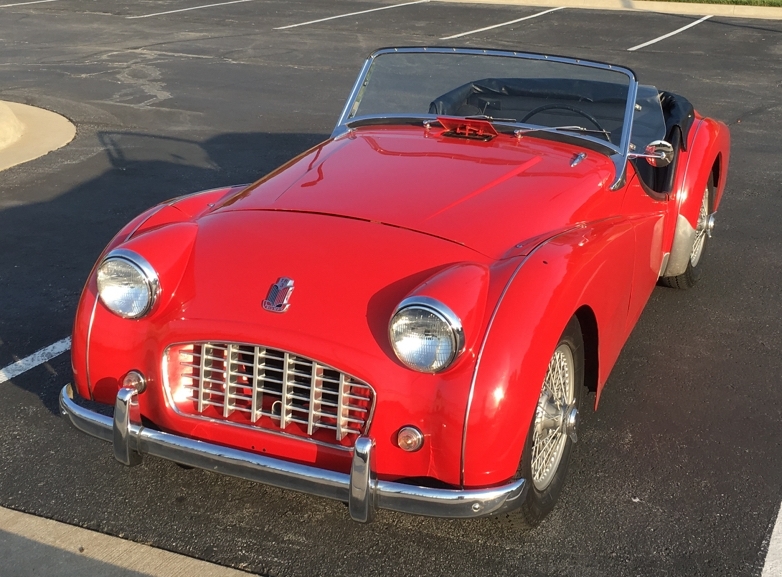 In 2017, nearing retirement, I decided I wanted another TR3, to use as a "daily driver" with an eye towards restoration. After looking all summer, online as well as traveling to various states to check out prospects, I heard about one for sale that had been restored frame-off in 1987, but then mostly stored. It was in Connecticut and was one of the rarer "smallmouths" which was my preference. We went to see it, drive it and I bought it! In November, I had it transported back home to Kansas and I spent the winter replacing all the rubber parts (including tires and wheels), rebuilding or replacing various other parts and doing cosmetic refurbishing. This summer, I've been driving it around town and keeping it up mechanically. I plan to do more work this winter, probably replacing the interior and some minor body work. Once I retire next year, I'll think about a full restoration, or at least an engine/transmission/rear end rebuild. It's been great to be back in a British sports car!